The Relais Hotel Borgo di Toiano, variegated with its blooming balconies overlooking a valley rich in green and historical monuments offers panoramic views and the very style and peace of a Tuscan villa. The reading room, the breakfast room, the reception and bar are situated in finely restored premises, they are very cosy thanks to the classic decor and ancient furniture. It is possible to sample the abundant buffet breakfast on two wide panoramic terraces. The 7 double rooms and the 3 junior suites are very comfortable, have terracotta flooring and are furnished with typical Tuscan style furniture; they are equipped with air conditioning, fridge bar, TV satellite, radio, telephone and hair dryer. The junior suites, with a beautiful panoramic view, have a small terrace near the swimming pool and are even able to accommodate families of up to 4 persons. The swimming pool, which receives the sun all day long, is surrounded by the terrace solarium and garden. Finally there is a large private parking area for guests. The hotel is not equipped with a restaurant, but offers a bar service with appetizers, first courses and sandwiches at lunch time (also at the swimming pool) as well as around dinner time. There are restaurants or pizzerias in the surrounding area from 800 metres away which are easily reachable. 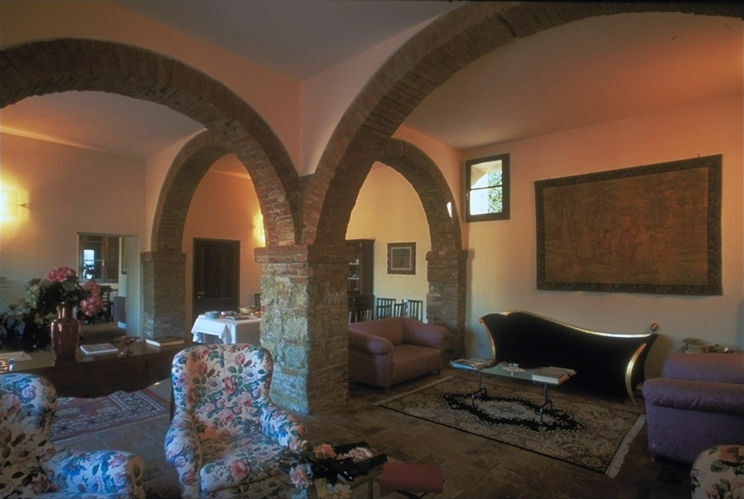 The Borgo of Toiano is situated only 9 km from Siena to which it is easily linked by the state highway 73 (Siena-Grosseto); the closest towns are Sovicille (2.5 km) away and Rosia (5 km). This hotel offers the opportunity of a complete holiday from a cultural, artistic, sports and recreational point of view.